According to a report in the Journal of the American Medical Association you can decrease your risk of an early death due to cardiovascular disease by 22 percent by drinking five cups of green tea a day. Since more people die of this disease than any other reason this alone should be enough reason to drink more of this beverage as it obviously promotes longer, healthier lives. Now, I’m a huge coffee drinker and I don’t think I’ll be making a full time switch over to green tea in the mornings but there’s nothing to say that I can’t have it later in the day and in iced form. After all, why drink it hot when it’s just fine cold? For a while now I’ve known that I don’t drink the amount of water that I should. I get my water predominantly in the form of foods, broths, and other drinks. Of course these are not as ideal as drinking it "straight up" but a nice iced green tea is pretty close in my book. It has no calories like coffee and even the caffeine content is not that bad, only a third of that of coffee. In the evenings and weekends I often find myself lounging around the house wondering what to sip on. Often coffee seems wrong because I’ve already had half a pot in the morning already, beer or wine seems to over the top as it might not be something I want to do all day long, water by itself seems to bland sometimes, and soda is obviously a death trap. 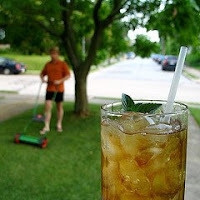 In situations like these I can imagine that a nice iced, unsweetened, green tea would be a fine beverage to sip on all afternoon. Not only does it provide an unbelievable amount of antioxidants and promote heart health but it is bitter yet refreshing, two things I love in a drink but find hard to merge together aside from coffee. 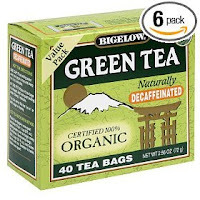 I recently did some shopping for green tea bags and good recopies to make iced green tea and came up with the following organic decaf tea bags from Bigelow Organics: Bigelow Organic Green Tea . This pack of 240 can make approximately 24 gallons of iced green tea and thus should last even the most avid drinker for quite while. Of course you could also run down to Walmart and find a generic brand pack of green tea bags for cheaper but hey; we live in an organic society these days. It's better for you. Anyway most people are into hot tea and from what I read from others some are savage about it. "You can't drink it cold!" Whatever, I'll drink it cold and we'll see if it makes me worse off; somehow I doubt it. Anything's better after all then drinking coke for dinner and this is no different. From what I've read you can just pour a gallon or so of water into a jug and drop in 10 or so tea bags and maybe a few lemon slices and just let it sit there for a few hours. Works for me. Comments on the subject are appreciated, and thanks for reading. Live long!